← The “In-between” Generation of Indians: Caught in Two Worlds or the Best of Both? The festival of Gowri-Ganesha in Bangalore has quite a few differences from the festival of Ganpati in Mumbai. In Bangalore, it is a private festival while in Mumbai it is a public festival. Almost everyone in Bangalore gets a ‘मूर्ति’ at home. While in Mumbai it is generally restricted to the eldest member of the extended family, though that is changing too with shrinking families, I think. Everyone goes to everyone’s home for ‘दर्शन’ and ‘प्रसाद’ and some gossip-gupshup in Mumbai. Once they know you have an idol at home, you get on to their annual visit list. No one does that unless invited in Bangalore – partly also because it is a private festival, partly because everyone has their own idol at home. 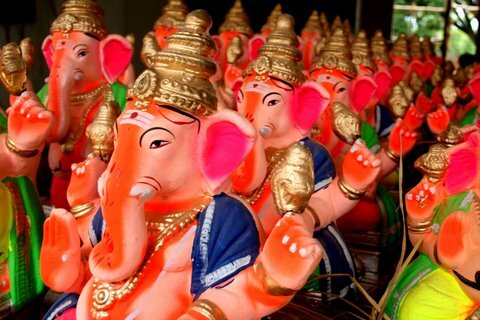 Also, while I was in Mumbai, I thought Ganesha idols are to be kept for a pre-determined number of days and that is to be followed every year. So you have 1.5, 3, 5, 7, 10 and 11 as the common number of days that idols are kept for in Mumbai. Most public idols and a lot of ‘serious’ private idols are kept for the entire period. In Bangalore it is relatively flexible. Most people do the immersion on the first day, and very few have it for all 10 or 11 days. Some people immerse the idol on weekends as it is convenient. Some people start initially with the intention of immersing in 1-2 days, and then think that maybe couple of days more will do no harm, so let’s extend. So that way it is quite flexible in Bangalore. In Mumbai, the ‘प्रसाद’ is generally sweet – with ‘मोदक’ leading, but supported by a whole lot of others – almost everyday a new sweet makes its appearance. In Bangalore, it is mostly not sweet – generally rice and ‘चना’, sometimes ‘वडा’, sometimes fruit salad maybe. The idols are also different. In Mumbai, you have all shapes and sizes, with various contemporary events unfolding on stage as well as in the idol. This year I was told the main ‘themes’ are the World Cup and Anna Hazare. Even small home idols come in all avatars with the Lord sometimes taking forms ranging from the funny to the outrageous. They make them with all materials from clay, plaster-of-paris to whatever. In Bangalore, all idols are more or less standardized, mostly made of mud, and look more or less similar. All you can choose is height that works for you, and maybe the color at best. They are quite understated definitely. 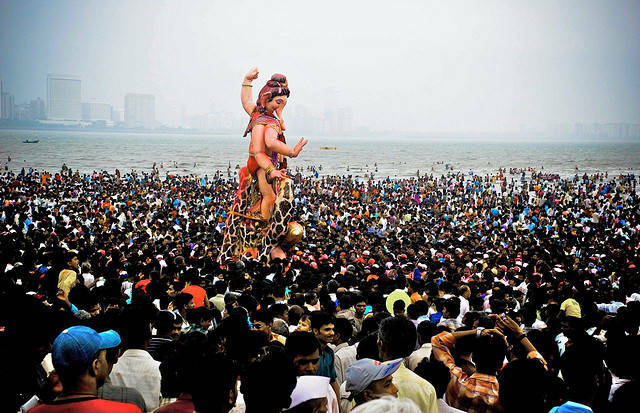 People in Mumbai immerse the idols in the sea. So, everyone from the smallest home idols to the largest public idols go to the nearest sea-shore on the west, and make a beeline. That way, Mumbai is lucky that it has a sea – difficult to imagine which other water body could absorb so much, and what a ruckus it would be without the sea-shore (not that it is any lesser now). In Bangalore, it is the lakes with specific designated areas for immersion – it is quite a disciplined affair. People also immerse their idols in buckets or tanks in their homes, and use the water for gardening. Initially, I used to find it awkward, but now I think it is a great idea that everyone should adopt. Honestly when I look at another year of the Ganpati festival, these differences do not matter much. The styles, rituals, methods may be different, but I think the underlying emotion, perhaps, is more or less the same. Just the scale and grandeur may be different. I also think what a wonderful festival it is, during which people actually bring God to their homes and public places, worship him and then give him a sendoff. And what an idea it was that Tilak came up with, when he decided to literally ‘take it public’. Therefore, despite the fact that we bring ‘God no.1’ into our homes every year for this period, it is quite ironical that when my son cries as we immerse Ganpati with slogans of ‘पुढच्या वर्षी लवकर या’ every year, I have to tell him, “God is not in that idol, he is in your heart”. He does not seem convinced. He will wait for next year.